Make the software your own and integrate the schedule in your customer’s website. Connect SuperSaaS with other apps via webhooks and API. You can configure the system for your customers and customers start paying only when they exceed the free trial limit. You can fully white-label the software with no reference of our brand visible to your clients. You can also take advantage of creating a custom domain name, customizing “from” address for email reminders, adding a brand logo, setting the redirect URL and much more. Use our infinite free trial which allows up to 50 upcoming appointments. So you can configure the account and try the free booking setup for your customers without any monetary commitment. Once you pass on the account to end user they can pay for their own subscription. You can also choose to increase your profit margin by paying a flat subscription fee per account and charging extra from your customers. Configure the customer account and hand it over to them for future self-service or opt for a reseller account when you have a long-term relationship with your customers. The reseller account gives you the freedom to access a customer account as an admin and troubleshoot/customize at a later stage when required. You can extend the functionality of the schedule by integrating it with your own web applications and/or back-end systems. You can also use the API to create and update information in the database directly. Connect easier with Webhooks: Webhooks can be easily configured without any programming using third-party integration tools like Integromat and Zapier. It is also possible to customize the content of the webhooks and send them to the server directly. Access API Libraries: You can easily integrate SuperSaaS API into your project using our official API client library tailored to your programming language or platform. Single sign-on widget makes login simpler: Use the single sign-on booking widget for your websites for content management systems like WordPress, Joomla or Drupal. 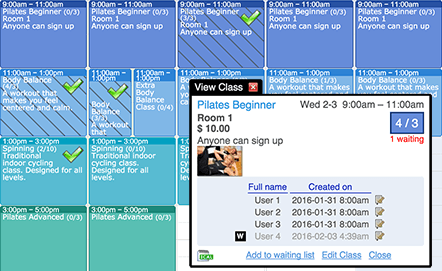 Seamless integration with your website: Customize your “Book Now” button or add easy to scan QR codes to link back to the schedule or simply integrate your schedule within an iframe on the website. Accept and collect online payments: Your customers can sell packages with the credit system, charge full price or partial price such as a confirmation deposit from the end users or allow the users to pay later. Set up flexible pricing rules: Create your own pricing rules based on length or start time of the booking, for specific days or dates and so on. For example, increase booking price by 20% on weekends or offer discount coupons applicable only for specific happy hours. Offer coupons and gift cards: Help your clients in increasing sales by offering discounts and promotions from the schedule like a one-off seasonal discount, discount for first-time users or customized offers like “Buy one get one”, “Buy 2 get 3”, “Buy 3 get 5” and so on. It’s also possible to limit the discounts to certain user groups, for example, a 15% discount for certain club members. Increase your revenue and grow your business with SuperSaaS’ Online Booking System. What more can you do with this versatile appointment planner? Send customized email/text reminders: The system can send automated email/text reminders, follow-ups, and notifications to end users. It’s easy to customize the standard emails to include specific client information or replace them altogether with tailored content. Add your own branding: Use custom domain name for the schedule, customize the layout colors, add a company logo on the schedule as well as on the dashboard, redirect customers to specific URL and much more. Manage multiple locations and time zones: Generate more revenue by managing multiple locations for your clients with access to unlimited schedules, unlimited users and automatic time-zone adjustment in paid packages starting from $8/month. Control who can access the schedule: Allow anyone to view and book your schedule, request users to create an account to make a booking or restrict access to schedules for people with certain email domain, to specific IP addresses, people you specify in advance or people who know the shared password. Customers can also provide special privileges to team members by making them superuser for specific schedules. Synchronize with other calendars: Prevent double bookings on the calendar by syncing the schedule with external calendars like Google Calendar, Outlook, iCalendar, etc. Create and attach custom forms: Create access to unlimited custom forms to request more details from end users or agree to certain terms and conditions before creating a booking on the schedule. Speak the language of your customers: Irrespective of which part of the world you live in, you can access the end-user screen in over 35 languages and enjoy our customer support in a total of 11 languages. Learn how to implement webhooks and API with our software.